Be Kind [C5558] - $10.00 : Yarn Tree, Your wholesale source for cross stitch supplies. Cross stitch pattern Amy Bruecken Designs. Kindness is a gift everyone can give! Included is three different designs. 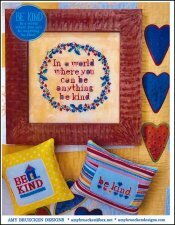 "In a world where you can be anything be kind," is stitched with a floral wreath encompassing the phrase. Warm hearts welcome you into the second design, with a home stitched next to "Be Kind." The third has "be kind" stitched with colorful hearts stitched below & one heart for the "I" in "kind." Stitch counts: Frame is 100 x 100, House is 34 x 36 & Kind is 41 x 18.